Hello winter, and hello Brighton Winter Farmers’ Market! The new season opens this Sunday, November 25; join us Sunday afternoons, 1-4 pm, indoors in Brighton’s Brookside Center, 220 Idlewood Rd. (access to the building also from S. Winton between Westfall and 590). We’re so lucky to have year-round all-local, high quality food, and farmers and producers who are able to keep us well-fed during the chilly months. Supporting these hard-working folks during their traditionally lean months helps assure their success and our continuing access to the food that we value. This week Andy’s Specialty Produce is bringing certified organic carrots, spinach, sweet potatoes, salad mix, arugula, green kale, green leaf lettuce, yellow onions, red beets, green cabbage, purple cabbage, napa cabbage, daikon radishes, red and yellow potatoes, and sunflower and pea shoots. Stonecrop Farm is bringing pasture-raised pork chops, shoulder roasts, breakfast sausage, ground pork, soup bones, trotters, organ meats, and leaf fat. K&S Bischoping will have a good selection of apples — Honey Crisp, Snapdragon, Jonagold, Crispin, Empire, and Gala, as well as some heirlooms. Happy Hooves Organic Farm is bringing cuts of 100% grass-fed and grass-finished Hereford beef, cuts of pasture-raised heritage breed pork, and raw wildflower honey; all animals are raised on pasture without soy, corn, or wheat. Fisher Hill Farm is bringing lots of veggies, chicken, stewing hens, eggs, and Red Jacket juices. Clearview Farm is bringing certified organic green acorn, carnival, spaghetti, butternut, and red Kuri winter squash; dried Tulsi (holy) basil; dill; catnip; truly free-range eggs; buckwheat; organically-fed 100% grass-grown Black Angus beef including steaks, roasts, ground beef, and assorted cuts; and Genesee Valley black and cannellini dry beans. Lavender Moon will have pre-ordered holiday wreaths and will take wreath orders for December 2 pick-up. Tripleberry Farm is bringing lots of traditional and reduced sugar berry jams, peach jams, moisturizing goat milk soaps, and fresh fudge, great for gifts. Newbury Park Pastries will have chicken, veggie, and panang pot pies. Flour City Pasta is bringing pasta in fall flavors and gift boxes. R&M Bischoping will have spring, summer, and fall honey; beeswax lip balms in ten flavors; beeswax lotion bars in a variety of scents; honey soaps in over 30 scents; and turmeric tincture, made with the farm’s own pesticide-free turmeric. We welcome Rick Crummins and Friends to the music tent. 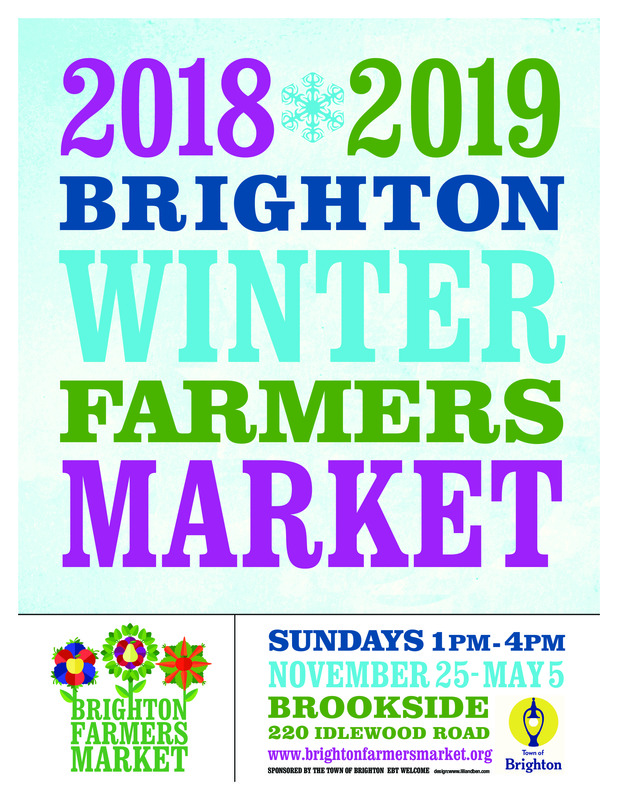 Brighton Winter Farmers’ Market is held Sundays, 1 to 4 pm indoors at Brighton’s Brookside Center, 220 Idlewood Rd., Rochester (easy access also from S. Winton between Westfall and 590). The Market is sponsored by the Town of Brighton. More information about the market can be found at https://brightonfarmersmarket.org or on Facebook and Instagram.